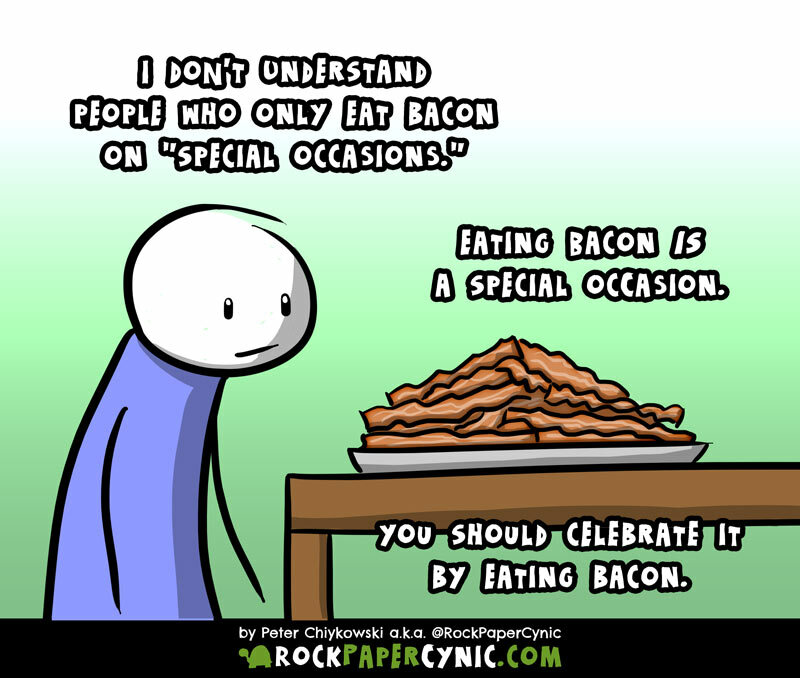 Seriously, though, this is true of a lot of special occasion foods. Foremost in my mind are pie, pancakes, ice cream, cake, and (of course) bacon. Originally I was going to make this into a comic about ice cream because I didn't want to go with the cliche pre-approved joke topic of how awesome bacon is. It's easy to get away with lazy bacon jokes just because bacon itself is so well loved. But then I thought about it and realized that, despite what I want to believe, I currently have much more bacon in my life than I do ice cream. And so, cliche that it may be, it's still more authentic for me to write a bacon joke than an ice cream joke (at least for the time being). When I turn 40 and inherit my dad's blood pressure problems, I'll probably be croaking a different tune.